Right away, Khosrau established peace on his western border by making a solid treaty with Justinian, the Eastern Roman Emperor. Justinian agreed to send money to the Sassanians every year instead of fighting. Like Justinian, Khosrau also re-conquered provinces that had been independent. That made Silk Road trade easier and safer. He created a new middle class of small landowners, the deghans, and used them to run the government and the army. This new middle class sent their boys to school. So there were soon lots of good schools in the Sassanian Empire, and many new scientific discoveries. Khosrau used the Mazdakite movement to establish a new, fair taxation system. That way his government had plenty of money to work with and people weren’t super upset about how he collected the taxes. So the Sassanians were able to train and pay their army well. 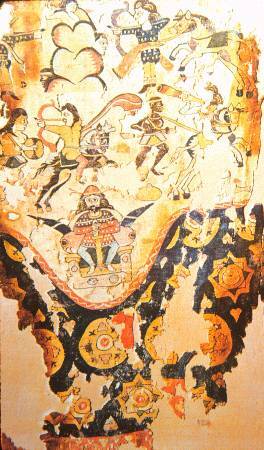 Like other strong Sassanian kings, Khosrau won victories against the White Huns. In the 550s he put his own candidate (an Ethiopian man) on the throne of Yemen, bringing this wealthy Arabian country into the Sassanian Empire. In 572, the Roman Emperor Justin II stopped making the payments his uncle Justinian had promised, breaking the treaty. Western Iraq and Syria were very rich places. Khosrau wanted the tax income from those places, either in the form of tributes, or by conquering them and collecting the taxes himself. So Khosrau conquered a fair amount of Iraq and Syria, before the new Roman commander Maurice stopped him. The Romans and the Sassanians were working on a peace treaty when Khosrau (now in his late 70s) died in 579. 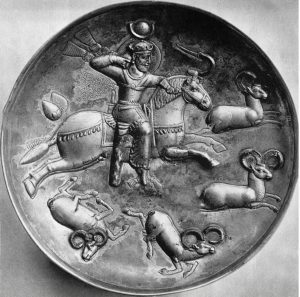 After Khosrau died, his son, Hormizd IV, ruled the Sassanian Empire. Hormizd soon abandoned his father’s peace talks. So the war between him and the Romans (fought largely by Arab mercenaries on both sides) continued through his reign. Not only that, there were invasions from all sides. The Ma’rib dam had just broken, destroying Yemen’s economy. So unhappy Arabs were invading the Sassanian Empire from the south. In the north, the Gokturks had just conquered the Rouran. Now they were pushing into Sogdiana and the Sassanian Empire. And the Khazars were invading from the east. Hormizd tried to continue his father’s policies. But, as in the time of Mazdak, there was a backlash from the powerful rich families and from the Zoroastrian priests. Hormizd killed a lot of these people, but that only made the survivors even more angry. In 590, they finally captured, blinded, and killed Hormizd. They made his son, Khosrau II, king instead. Cite this page: Carr, K.E. Sassanian kings Khosrau and Hormizd – the 500s AD. Quatr.us Study Guides, March 20, 2018. Web. April 23, 2019.